The Best Entrepreneur blogs from thousands of top Entrepreneur blogs in our index using search and social metrics. Data will be refreshed once a week. Also check out Top Entrepreneur Youtube Channels list for Top videos on Entrepreneur. 2.1 Entrepreneur Magazine | Start, run and grow your business. 2.8 Female Entrepreneur Association | Inspiring female entrepreneurs from around the world! 2.29 The Suitcase Entrepreneur - What Type Of Entrepreneur Are You? Entrepreneur newsletter is a comprehensive summary of the day's most important blog posts and news articles from the best Entrepreneur websites on the web, and delivered to your email inbox each morning. To subscribe, simply provide us with your email address. 1. Entrepreneur Magazine | Start, run and grow your business. About Blog Entrepreneur seeks to inspire, inform and celebrate entrepreneurs. We offer real solutions to the challenges you face as an entrepreneur, including tips, tools and insider news to help build - and grow - your business. Facebook fans 3,541,274. Twitter followers 3,392,380. About Blog The Entrepreneurs’ Organization (EO) is a global, peer-to-peer network of more than 12,000 influential business owners with 160 chapters in 50 countries. Founded in 1987, EO is the catalyst that enables leading entrepreneurs to learn and grow, leading to greater success in business and beyond. Facebook fans 136,772. Twitter followers 57,477. Facebook fans 112,823. Twitter followers 128,097. About Blog This subreddit is for entrepreneurs, wantrepreneurs, and anyone who just wants to put their mark on the world and make it a little more awesome. Facebook fans 1,137,372. Twitter followers 500,517. Facebook fans 117,651. Twitter followers 146,143. 8. Female Entrepreneur Association | Inspiring female entrepreneurs from around the world! About Blog EOFire features interviews with entrepreneurs like Seth Godin, Gary Vaynerchuk, Barbara Corcoran, Tim Ferriss and hundreds more. During a 30-minute interview, the spotlighted entrepreneur tells us about their journey, sharing early failures, AHA moments, and providing insights about the techniques that are working for them right now. Facebook fans 38,528. Twitter followers 57,297. About Blog Hey it's Andrew. Mixergy is the site where I ask proven entrepreneurs to teach how they built successful companies. Facebook fans 14,080. Twitter followers 43,907. Facebook fans 5,013,781. Twitter followers 13,438,028. About Blog Whether you're scaling up your small business or building a brand from scratch, we've got the resources you need to keep you at the top of your game. Facebook fans 1,731,669. Twitter followers 224,628. About Blog Inspiration, innovation and advice. An entrepreneur blog by Virgin. Facebook fans 315,841. Twitter followers 232,383. About Blog Get tips, read case studies, and learn how to grow your business with entrepreneurial insights from Grasshopper. Facebook fans 17,544. Twitter followers 12,674. Cambridge, MA About Blog forEntrepreneurs offers advice on the key issues founders and their teams face in getting started, getting funded, and building a successful company. Facebook fans n/a. Twitter followers 48,548. About Blog Location Independent Entrepreneurship. Start And Grow A Global Business From Your Laptop. Facebook fans 2,749. Twitter followers 17,973. Facebook fans 40,925. Twitter followers 1,469,174. About Blog Under30CEO is the leading media site covering news, advice, trends & events for the young entrepreneur. Facebook fans 33,784. Twitter followers 41,843. About Blog Entrepreneurial and business motivation and insight. Along with personal finance and lifestyle tips. Facebook fans 10,103. Twitter followers 215,882. About Blog Get detailed articles on Importance of Entrepreneurship, Sources of Business Ideas, Feasibility Reports, Characteristics of Services, Types of Entrepreneurs etc. Facebook fans 601. Twitter followers 3,128. About Blog Entrepreneurial Spark is the world’s largest free business accelerator for start-up and scaleup businesses. Our vision it to inspire and enable positive social change through the action of Entrepreneuring. Facebook fans 26,419. Twitter followers 34,747. About Blog All about entrepreneurship, intrapreneurship, ideas, innovation, and small business. Young Upstarts is an exciting opportunity that supports young people aged 16-24 to set up their own small businesses. We dare young people to believe they can be successful entrepreneurs. We encourage them to turn their thoughts into a working business idea. Facebook fans n/a. Twitter followers 1,762. About Blog Tips, Strategies & Advice For Entrepreneurs and Business Owners. Facebook fans 5,480. Twitter followers 33,273. About Blog We celebrate Nigerian entrepreneurs by letting them share their success stories with the world to motivate anyone into becoming a successful entrepreneur. Facebook fans 6,368. Twitter followers 260. About Blog Hack The Entrepreneur is a podcast that reveals the fears, habits, and inner-battles behind big name entrepreneurs and those on the path to success. Facebook fans 1,080. Twitter followers 3,801. 29. The Suitcase Entrepreneur - What Type Of Entrepreneur Are You? About Blog Natalie Sisson's Suitcase Entrepreneur website is the number one destination for those of you wanting to build an online business you love from anywhere. Facebook fans 20,611. Twitter followers 22,463. About Blog Advice and success tips to Help the average person go from employee to entrepreneur. Facebook fans 4,100. Twitter followers 1,202. About Blog LiftFund is a non-profit organization that helps finance new small business and startup companies. Get small business loans, SBA loans, and microloans in Texas and South Eastern USA. Facebook fans 14,880. Twitter followers 415. About Blog The Frugal Entrepreneur provides business tips, resources, and tools for frugal small and home-based business owners. Facebook fans 622. Twitter followers 16,026. About Blog EPN is the entrepreneur source for business advice, information, motivation, inspiration & major live event coverage. Supported by some of the most renowned success stories in business today - The E Podcast Network streaming on demand 24.7. Facebook fans 1,562. Twitter followers 3,117. About Blog Branding & visioning for creative entrepreneurs to close the gap between their dream & their actual creative business vision. Facebook fans 5,650. Twitter followers 5,236. About Blog Welcome to Entrepreneurship Life, the place where entrepreneurs, start-ups, and business owners can find wide ranging information, advice, resources, and tools for starting, running, and growing their businesses. Facebook fans 473. Twitter followers 701. India About Blog TheBrandboy.com is a creative Business blog on business ideas, Marketing, Advertising, Naming idea and Technology for Entrepreneur and Marketer. Facebook fans 57. Twitter followers 14. Nigeria About Blog TheTotalEntrepreneurs is a weblog for emerging entrepreneurs, startups and business gurus seeking new ways of exploring the internet world, new marketing strategies, latest business news etc. We provide relevant information, tips and business news for entrepreneurs. Also grant entrepreneurs interviews, share success stories and new technology trends. Facebook fans 3,531. Twitter followers 86. About Blog Our vision at the Entrepreneur Academy is connecting the world of entrepreneurship with the social aspect of life. Empowering people who want to create a real positive impact in the world to become real change makers is our mission. At the Entrepreneur Academy we aim to make a difference in the world. Facebook fans 1,071. Twitter followers 381. About Blog Create success and FREEDOM in your Solo Entrepreneur business FASTER with our biz growth, marketing, tech and personal development resources! Facebook fans 9,670. Twitter followers 2,624. About Blog The Nashville Entrepreneur Center is a non-profit connecting entrepreneurs with critical resources to create, launch and grow businesses. Facebook fans 10,871. Twitter followers 12,885. About Blog Entrepreneur Resources is a PR-friendly blog written for current and aspiring business owners who do not have access to traditional business education. Facebook fans 951. Twitter followers 3,832. Singapore About Blog Adrian is an author, speaker and recipient of HR Entrepreneur of the year in 2013. He helps companies and individuals acquire the skills necessary to recruit better talents and succeed at work. Facebook fans 693. Twitter followers 822. About Blog Advice and tips on how to start and grow your own business. Become an entrepreneur. Learn how to start your own home-based business. Facebook fans 18. Twitter followers 97. Cape Town, South Africa About Blog Rise Africa Rise is a blog focused on providing game-changing insights for African entrepreneurs, digital marketers and technies to scale their businesses across Africa and beyond with the right technologies and digital strategies. Our aim is to provide you with valuable resources, relevant information, inspiring content and a supportive online community to help your company scale across Africa and beyond while creating positive impact throughout the continent. Facebook fans 1,436. Twitter followers 669. About Blog Startup, Business and Entrepreneurs' Lifestyle on PreneurDigest. Dear aspiring entrepreneur, If you want to do it, DO IT NOW to avoid eternal REGRET. Facebook fans 35,002. Twitter followers 8,509. About Blog Lifestyle Entrepreneurs Press is the entrepreneurial author's secret weapon. Our mission is to help authors become entrepreneurs, and entrepreneurs become best-selling authors. Facebook fans 32,884. Twitter followers 6,726. About Blog The Entrepreneur's Source has over 30 years of experience in Alternative Career Coaching that can transform your life from Employment to Empowerment. Facebook fans 8,751. Twitter followers 1,975. About Blog Are you an entrepreneur who is passionate about your business, committed to your success and prepared to do what it takes to realize your dream?Alberta Women Entrepreneurs (AWE) provides tools to help women across Alberta succeed in business. Facebook fans 4,343. Twitter followers 9,854. Kenya About Blog The Penny Matters is a home of content creators and online entrepreneurs who want to create value with great content. We empower you to write to their hearts, and not their heads. Facebook fans 639. Twitter followers 15,697. About Blog Follow us to keep up with articles on entrepreneur from hbeonline Magazine. About Blog OnEntrepreneur is a media which explores the world of Entrepreneurship, Business, Startups, Marketing and other closely related fields. Facebook fans 144. Twitter followers 130. About Blog I am an author, blogger, and innerpreneur. I write about love, business, and the spaces in-between. A blog by Tara Joyce. Facebook fans 795. Twitter followers 2,833. About Blog A digital platform where entrepreneurs & small business owners can get the answers they need to launch and grow their businesses. Facebook fans 1,496. Twitter followers 2,541. About Blog Entrepreneurship-interviews.com is about finding out true stories about real life entrepreneur and their businesses. It’s about business ideas, funding, opportunities, putting together teams, starting up and failure. It’s the Entrepreneurs “reality-show”. Entrepreneurship-interviews.com is out there because business owners love to tell their stories. About Blog Are you disabled? Thinking of a business? Disability putting you off? want to meet other disabled entrepreneurs? Need finance? public speaker? Join Us? Inspiring and supporting disabled people through up-to-date news, networking business ideas, public speaking and inspirational stories. Facebook fans 1,718. Twitter followers 2,344. Malta About Blog If you want to find out how to make running a business more fun then check out The Fun Entrepreneur's handy advice to start, grow and run a business. Facebook fans 186. Twitter followers 112. About Blog Making it big in business after age 40. Freelance writer, blogger and author of Late-Blooming Entrepreneurs: Eight Principles for Starting a Business After Age 40. A blog by Lynne Strang. Beside the seaside, UK About Blog Copywriting and content marketing courses for entrepreneurs and small business owners who want to write their own website content and blog posts. Facebook fans 1,377. Twitter followers 1,319. About Blog The HEA is an online community that provides holistic entrepreneurs actionable resources & tools to build successful and authentic businesses & practices. About Blog CEO Chrissie Lightfoot – solicitor/lawyer (non-practising); entrepreneur; national award and prize winning researcher; woman ambassador; legal sales educator. Facebook fans 446. Twitter followers 11,318. Mumbai, India About Blog Entrepreneurship Blog by Anubhav Anand. About Blog Welcome to the Age of Metapreneurship: Modern entrepreneurship: Entrepreneurship 3.0. They are the new leaders and visionaries of entrepreneurship 3.0. The Modern Revolutionaries. Fast paced, lean, rapid concept to mass market - but it's much more than that. Modern entrepreneurs collaborate, they share, they self-organize and work in ways that were never possible in prior generations. Facebook fans n/a. Twitter followers 27,385. San Francisco, CA About Blog Soulful Selling empowers introverts to become more visible and promote themselves with confidence & authenticity. Facebook fans 2,830. Twitter followers 946. About Blog A Blog to Boost Your Entrepreneurial Skills in Life Sciences. Facebook fans 420. Twitter followers 423. About Blog What if there really were a series of simple, easily teachable, and very duplicatable techniques, you could learn to quickly build your success, in Network Marketing. Would you be interested to learn those skills? If you answer is yes then let the journey begins. About Blog Yale's only dedicated publication for entrepreneurship. Facebook fans 658. Twitter followers 282. About Blog I'm Deborah A. Bailey, AKA "Coach Deb" on my Women Entrepreneurs Radio podcast. I'm a writer, but for the most part, I am a storyteller. I love to bring stories to life - real stories of the guests I interview on my podcast, the life experiences I write about, and the characters I create in my fictional worlds. Facebook fans 739. Twitter followers 622. Rockville, MD About Blog Welcome to The Law Entrepreneur by Neil Tyra. This podcast is all about where the law and entrepreneurship meet. Facebook fans 117. Twitter followers 420. About Blog I #Believe in entrepreneurs. A blog by Evan Carmichael. Facebook fans 24,909. Twitter followers 233,187. About - Perspectives of a 2x entrepreneur turned VC at @UpfrontVC, the largest and most active early-stage fund in Southern California. Follow to know more. About - She Owns It is about celebrating, supporting and inspiring women entrepreneurs. We empower women to write their own success stories. About - Hey it's Andrew. Mixergy is the site where I ask proven entrepreneurs to teach how they built successful companies. About - For Entrepreneurs offers advice on the key issues founders and their teams face in getting started, getting funded, and building a successful company. About - Under30CEO is the leading media site covering news, advice, trends & events for the young entrepreneur. About - Just Entrepreneurs is an online media publication for entrepreneurs giving advice, resources, digital mag and inspiring interviews. About - Oxford Entrepreneurs is Europe's largest student Entrepreneurship Society.Their purpose is to support budding entrepreneurs at Oxford University and beyond find, define, and realise their purpose by going from idea to a sustainable enterprise..
About - Entrepreneur First is the best place to find a co-founder, build a company and access the best investors. EF helps the best technical individuals build startups together from scratch. About - The NEF create a new generation of outstanding entrepreneurs who will build market-leading businesses and play a key role in driving Britain’s future prosperity. They want to transform UK business by developing the entrepreneurial leaders of the future. About - Are you disabled? Thinking of a business? Disability putting you off? want to meet other disabled entrepreneurs? Need finance? public speaker? Join Us? Inspiring and supporting disabled people through up-to-date news, networking business ideas, public speaking and inspirational stories. About - Canada Business Network promotes entrepreneurship and innovation, and provides assistance through an organized network of service centres across Canada. They contribute to your success through sound business planning, market research and the use of strategic business information. About - Futurpreneur Canada has a broad network of entrepreneurs, mentors, and volunteers who contribute content for our blog, and offer industry insights and tips to help build entrepreneurship in Canada. About - Hi ​I'm Karla Briones and I help new immigrants open businesses that survive past the startup phase. I have made mistakes, learned from them and have grown as a new Canadian and entrepreneur. I am passionate in empowering other immigrants such as yourself to open up successful businesses the "Canadian" way. About - GoForth Institute's blog, written for anyone with an interest in small business and entrepreneurship, is your source for news, important small business topics and helpful advice. About - CCSBE is the only member-based organization in Canada whose goal is to promote and advance the development of small business and entrepreneurship. It provides a collaborative marketplace for the exchange of ideas, research and best practices among academics, practitioners and policy influencers. About - Generation Entrepreneur aims to instil the fundamentals of entrepreneurship in the minds of the future and bridge the gap for students to the real world. It brings entrepreneurship education to HS students through experiential learning. We empower young people through entrepreneurship. About - SBE Australia, helps female founders access the tools, expertise, networks and knowledge to help them build and scale global, sustainable businesses in high growth industries. We understand that female founders often face a unique set of challenges, in addition to those common to entrepreneurs. About - Entrepreneur India gives information, insight and inspiration for entrepreneurs to start, manage and grow businesses successfully in India and globally. They offer real solutions to the challenges you face as an entrepreneur, including tips, tools and insider news to help build and grow your business. About - YourStory is India's leading media-tech company for entrepreneur's. It brings you stories of entrepreneurs and change-makers, funding analyses and the first glimpse of emerging trends from India’s entrepreneurial ecosystem, as well as profiles of great businesses and entrepreneurs from all over the world. 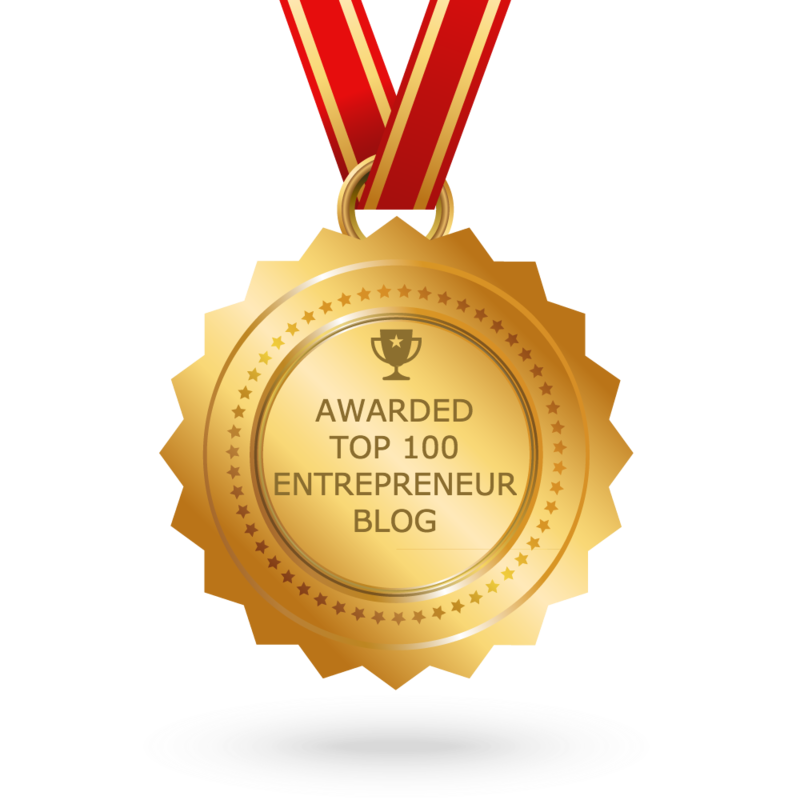 CONGRATULATIONS to every blogger that has made this Top Entrepreneur Blogs list! This is the most comprehensive list of best Entrepreneur blogs on the internet and I’m honoured to have you as part of this! I personally give you a high-five and want to thank you for your contribution to this world.